Milk. Organic products that are high in nutrients and fats such as cheese, cream and butter are made from milk that is high in nutrients and fats. We give it to new borns, children, the elderly and our pets; but how come some of us can tolerate it yet others can’t? For those of us who are lactose intolerance, we know the hardships that comes with ingesting milk related foods; we begin to feel bloated and sluggish, then comes the gut wrenching pain which can then be followed by diarrhea or constipation. First, lets look at what lactose intolerance really is? Many people get confused between an intolerance and an allergy, if you’re unsure check out my previous post ‘Food Sensitivities … What Would Darwin Say? Evolution or Devolution?’. Lactose is a sugar found in milk, in order to metabolise the sugar into energy you need ‘lactase’; an enzyme which breaks down the sugar (lactose). For those of us who are less fortunate not to have this particular beneficial enzyme, lactose will pass through the digestive system, once it reaches the small intestine the sugar ferments, which in-turn causes bloating, flatulence and diarrhea. Who First Started to Drink Milk? I always wondered whether the first people who started to drink milk (Neolithic Era; 8000 B.C) were like “Oof! You know what love, I’m thinking that milk stuff, isn’t agreeing with me…” (yep, I’m pretty sure this is how the cavemen would’ve spoken). The Neolithic’s enjoyed drinking the milk of animals as opposed to just eating the meat. This was seen predominately in the northern European region especially Britain and Germany, which is why there’re less reported cases of lactose intolerance, whereas in Italy and Spain the number are higher. Drinking unprocessed milk was mostly an act of nomads, neanderthals traveling rather than settlers. Anthropological studies have shown that these populations evolved to tolerate the consumption of lactose. 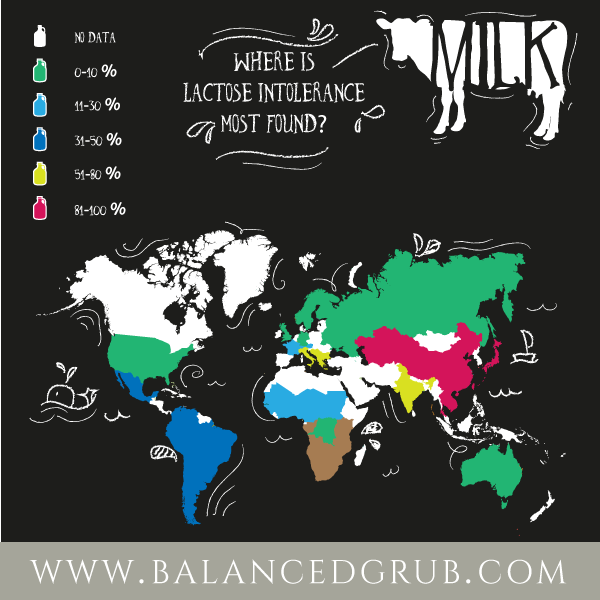 Whereas in Asia, South America and Southern Africa have the highest reported cases of lactose intolerance due to the fact they did not frame milk from animals for consumption. Primary lactose intolerance. As children are weaned they lose the ability to metabolise milk, so they become lactose intolerant adults. Secondary lactose intolerance. This occurs in adults from lactose tolerant populations who, due to damage caused by diseases of the stomach or intestines, can no longer properly produce lactase. Congenital lactose intolerance. This is a condition where children are born unable to metabolise lactose. Before the 20th century it would normally have resulted in death, but it can now be diagnosed and treated by moving the infant to a lactose-free diet. Well, yes and no. Most people who suffer with it, are still able to consume up to 12g a day. I have been proven that with supplementing probiotics which contain lactobacilli acidophilus, which help the microbes in the gut work harder and in turn produce their own lactase enzyme. I take a probiotic everyday to help regulate the bacteria in my gut which I find helps me to have small amounts of milk throughout the day and have no ill effects. I also feel like I have been able to build up my tolerance a little more over the past year, which I’m pretty chuffed about.